Oguro: How about the scene in episode 12 where Kumiko is running and saying “I want to improve!”? I thought the finished product was spectacular, but not just the way it was put together; I was surprised that a scene with that much energy put into it was made right before the final episode. Ishihara: Honestly, I overlooked it when I was checking the storyboards. Yamada: The photographers also have fun adding a little show-off portion while working, but it felt like they were really enjoying working on that one. Yamada: They were. Miyoshi-san said “there’s no other choice but to run here.” I was drawing the storyboards for the finale at that time, but I thought and wanted the finale to be flavored with the most spectacular cool feeling. And yet here were these amazingly finished storyboards….. I thought Miyoshi-senpai wanted to use his entire strength to crush his juniors. Ishihara: Perhaps Miyoshi-san just thought “well, only this cut will have moving backgrounds.” But besides that scene, his control of light in episode 12 was amazing. Yamada: It was amazing like when the summer light is reflecting when Kumiko is practicing or off the top of the bridge when she’s running. Even the ones in the shadows are also amazing. He’s able to make you easily empathize with the work. Ishihara: For anime directors, this kind of work is the easiest to understand. Oguro: Because you’re depicting points with that “straightforward” sensation? Yamada: Right. That kind of “It’s okay to not be bashful, it’s fine to do it straightforwardly” mood is very pleasant to work with. Oguro: When you mention the reflecting summer light, you mean the scene when Reina appears as Kumiko is practicing? Yamada: Right, that amazing guy. I was startled when I saw the retake of that scene. I felt uneasy for a moment as I thought if, by some chance, this work became a movie, we’d have to go above that quality of work. Oguro: Then, the density of episode 12 would be due to the power of its director, Miyoshi-san. Yamada: Right. I feel like Miyoshi-san still keeps a secret hidden jewel somewhere. Ishihara: He never weakens. His strength is still there. Oguro: Speaking of episode 12, the cut where Yuuko chases after Natsuki is a cool cut. It became popular among the fans too. The number of gags feels like they decreased abruptly in the series. Ishihara: Ah, that lovely girl. Yamada: Actually, I wanted to have more of an octopus leg feeling for that cut. Ishihara: Right, in the storyboards at the cut where Natsuki goes around Yuuko, we added more legs to where she felt like a monster. Of course people said “please stop it.” But it was okay as it related to the work. 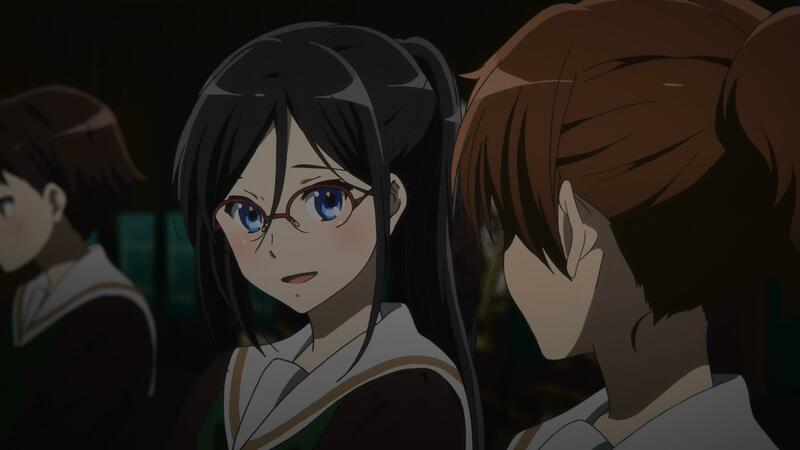 Oguro: So with Euphonium, it felt like there was a line that you crossed to make it feel like an older gag manga with the expressions. Ishihara: Right. This show didn’t have the signs and emotive symbols though. Oguro: There were gag expressions occasionally at the start, but gradually they were reduced. Ishihara: The first half was made slightly easier for the late night anime audience to watch it. Of course, the subject matter gradually became more realistic, so we wanted the imagery to go that way too. Yamada: Perhaps it’s more passionate. Oguro: From episode 8 onwards? Ishihara: Maybe from the middle of episode 7. Episode 7 is a bit of a heavy episode…..
Yamada: Episode 8 is a bit of a lethal weapon. Oguro: You could call the story that. Yamada: Yep, I think so. Oguro: I thought that a different anime had just started. Ishihara: Was that the only episode without a performance? Ah, was there one? Ishihara: Well, but the B-part was just about the mountain climbing and the festival, right? Oguro: I’ll ask something basic. Why did episode 8 have so many scene cuts such that the usual ending was pushed out of the episode? Yamada:……. Because it was flooded with the girls’ emotions. Ishihara: Yes, the length was extended, but the outline was just as you would imagine. Oguro: I have a feeling I’d understand. Ishihara: Lots of episodes have necessary cuts, but episode 8 in particular had a lot of them in it. Kumiko and Reina’s mountain climb couldn’t go forward if we snip-snipped the cuts; it’d be worthless if we abridged it too much. Essentially, we don’t like to cut off the endings in our works, but for that episode alone we requested to do so to the producers. Yamada: For that episode, we had to depict Kumiko and Reina’s feelings as very important, but Hazuki’s broken heart needed depicting as well. We had to properly show both portions; it’d be useless to just have a digest of what happened. If we over-did Hazuki’s story, then Kumiko and Reina’s tale may be seen as something careless. In short, if we screwed up, the viewer would think “this girl just got her heart broken. What are those two girls doing?” It was a dangerous episode, so we had to continually stack each emotion as important. By all means, the length continues to swell up. There were an awful lot of cuts compared to episodes too. Ishihara: The length was an issue more than the amount of cuts. Oguro: I thought generally you just check the length of the story when checking the storyboards, but you can also insert things to length it too. Ishihara: However, episode 8 finished nicely, so that’s thanks to Yamada. Ishihara: I was anxious over the length of episode 8. I kept thinking “what will we do if we need to remove something?” all the way to the cutting stage. Oguro: Reina’s finger touching Kumiko’s lips had a lot of impact too. Whose idea was that? Yamada: That kind of late night sensation came during work on the storyboards. I very much enjoyed that “writing a love letter” feeling it had. Kumiko gradually appeared to look like a young boy during the mountain scenes. I thought “giving the feeling of a young boy falling in love one summer” would be nice. It’d be a “first” for Kumiko. Oguro: Like a first kiss? Yamada: I don’t know how to say it. Like a first experience. Ishihara: But here is another difference between men and women. Do you think a man could have drawn that storyboard? Oguro: No, it’d be impossible. Ishihara: Right? (laughs) I feel like if a man drew it, it’d be more lewd. Oguro: Right, right. Somehow, it felt like I was seeing a real yuri work for the first time. Yamada: I get it. But I think it shows how there’s no uncomfortable feeling between Reina’s emotions and Kumko’s emotions in their relationship. Oguro: Right, no uncomfortableness at all. Oguro: When I saw episode 8, I thought “So this is what a yuri work would be.” It’s a different yuri than what men fantasize. Ishihara: Yes, yes, that’s right. Oguro: I’m not that familiar with yuri manga as well, but this wasn’t the soft fluff that they feel like; this was a work staged in the real world much like a manga for older women. That temperature also felt realistic. Ishihara: That’s right. But it’s an example of how Yamada can go overboard occasionally. Ishihara: I thought so in Tamako Market. It was awfully realistic. Oguro: What, is that true? Ishihara: She’s awfully serious when it comes to depicting yuri. Oguro: But you don’t think of it as yuri, Yamada-san? Oguro: I thought there was also some yuri in Tamako Market. Yamada: Ah, that’s right. Surely you mean about Midori. Ishihara: Well, that doesn’t go to where men want yuri to be. Oguro: (interrupting Ishihara) No, no, if Yamada-san doesn’t think it’s yuri, then it’s not! Ishihara: (continuing on) What men want is a bit more giggly chuckly…..
Oguro: Sorry. I got a bit excited. Yamada: Okay. So I’ll say it clearly: I don’t think that’s depicted as yuri. I wanted to depict adolescence. Yamada: Probably for all of them. For Tamako, for Reina, for all of it. I wanted to depict adolescence! Oguro: Did you want to depict the feelings during that time. Yamada: Yes, I wanted to depict those feelings. I have an interest in those points of view. Oguro: Continuing on episode 8, when Reina sits down on top of the mountain, her skirt gets lifted, doesn’t it? That was also magnificent. Yamada: It was, wasn’t it? The storyboards had “her skirt won’t stay still until the very end” written, but it felt like it became “ba ba ba booosh.” I was surprised. “Amazing! It’s expressed like this too!” It was more of a “swoosh” feeling than I imagined. Oguro: The skirt was so long that it became groundbreaking. It was the first time I saw something like that in anime. Yamada: It was nice……. So while Kumiko was entranced with Reina, Hazuki had felt some bitterness. Oguro: I understand. So you balanced it out. After that mountain event, Kumiko gets somewhat pulled too much near Reina doesn’t she? Or should she be pulled too much to her? Ishihara: Right, that was our plan. Yamada: Right. Experiencing something like that dream…. It’s an experience that makes you think “I’d be alright with dying today.” It’s something that stays in your heart. Kumiko is that kind of susceptible girl too. Oguro: So after that, though the story between Kumiko and Reina is the core of the story, there wasn’t a depiction where Kumiko is only thinking about Reina. Oguro: I’d like to ask something relating to the setting. 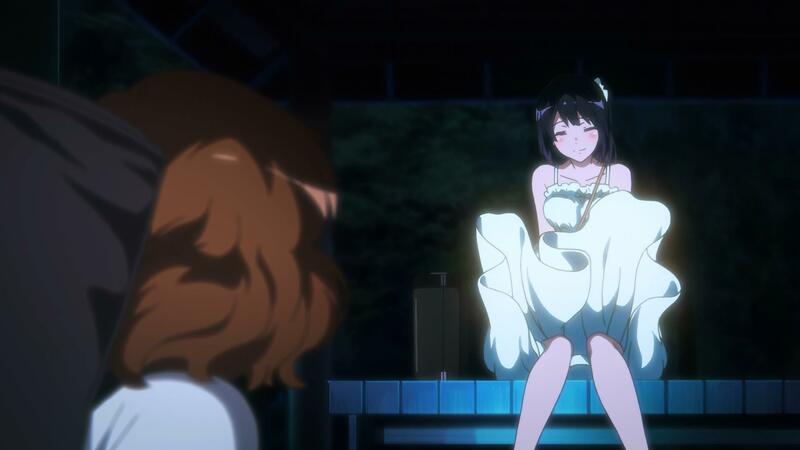 They went to the festival by chance, but it seems like Reina was also thinking about Kumiko up to that point. Yamada: Yep, she was thinking about her. Oguro: So Kumiko wasn’t aware of how Reina felt? Yamada: Kumiko…..is a bit awkward, so that’s how it went. Yamada: Kumiko thinks that Reina dislikes her. So she wants to keep her distances, but she’s awfully curious about her. That’s how it goes. 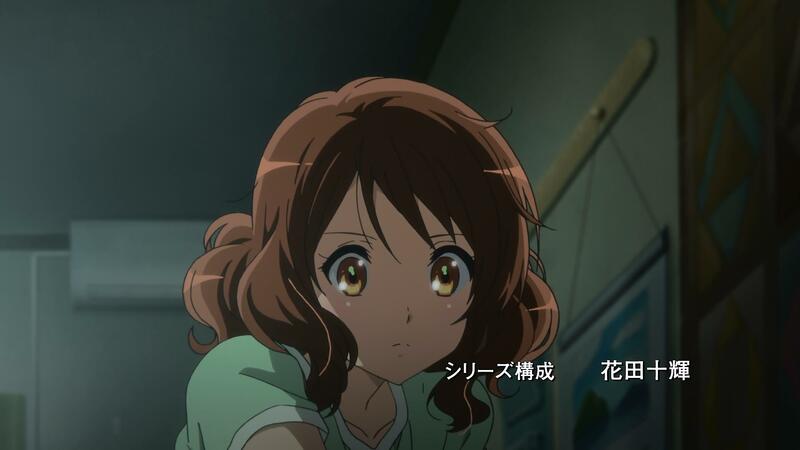 Kumiko isn’t the type to suddenly make a move herself, so she waits for the other person to do something. Conversely, Reina is very, very aware of Kumiko. Ishihara: Yes, she is. Though that depiction wasn’t inserted much, it was more or less from the novel. We added a few scenes like the walking-home scene in episode 5. Oguro: I see. With that timing, I’ll ask something unrelated. Is the image of Reina in the ending after the final episode? Ishihara: I think so. But that ending supposes that those two get closer. Yamada: Yep, it does. Therefore, strictly speaking……..it became something to note after episode 8. Oguro: When you drew them, you felt they’d understand as the story progressed. Yamada: Of course. Since it’s something you don’t see in the first half, it might appear to be something suggestive in the ending with no real meaning. Oguro: Did you possibly think that it could be seen as yuri and playing to the viewers with no relationship to the main story? Oguro: I see. So you felt that understanding “she smiles like this after episode 8” would be right? Yamada: I thought it was fine. (laughs) Reina’s smile is cute. She’s just an ordinary girl. Ishihara: No, I think she’s an amazing girl who’s greater than ordinary. Yamada: It’s a bit different to me. She’s like Kyouko Fukada. Yamada: Yes, Reina has that “Kyouko Fukada” sense. Oguro: Is that your image too, director Ishihara? Ishihara: Was that meant to be similar to a role she played? Or possibly…. Yamada: She’s a character who holds the personality Kyouko Fukada has. Yamada: She’s devilish or rather…. She holds people near to her captive….. I’ve not met her myself, so I might be completely wrong. Yamada: That’s Reina’s story. (laughs) Reina is very artistic; she lives very honestly. It’s truly charming. She’s not very logical; she happens upon a lot of things by chance. Yamada: That’s why she says things abruptly like “I like Taki-sensei.” It’s very illogical, but her feelings are very strong. Thus she’s charming. She’s the number one person who you moved around. Oguro: Who did you want most to move Yamada-san? Yamada: Reina is devlish or rather, she’s so cool in that she lives honestly with her feelings. If she likes you, it’s a bit rough, right? Ishihara: It is a bit rough, but it’s very unsuited. Yamada: Right. It feels like it’ll always be unrequited. Ishihara: It probably would be as bad if it wasn’t Taki-sensei. I think she ought to go after someone her own age. Ishihara: I think it’s bad if you don’t hold on strongly. Oguro: What color most strongly does the character of Asuka-senpai reflect for you two? Ishihara: Hmm, what do you mean? Oguro: I thought your sense of coloring was very strong, Ishihara-san. Ishihara: Ah, somewhat. When making something, I more or less project the character how I think they themselves are. Now that I say that, I think Asuka may be like that. Ishihara: Right. She’s the type that you can’t project and can’t depict….. hmm, I say that, but that’s not quite how I meant. She’s a “is there and will save you character.” She’s the character who wants to say things, so she will to make the story advance. If I have to choose, that’s Asuka. Yamada: That’s right. I paid attention to her since, as Ishihara-san said, he couldn’t see her. (laughs) Asuka is as Asuka will be. Ishihara: Yeah. Well, Of course it’s not as simple as “Asuka=herself.” However, I think the best person you could say about that would be Asuka to me. Yamada: Asuka appeared in some points as a “honest pervert.” So she’s someone with a communication impairment…..
Ishihara: Asuka? Ah, well I can see how that meaning could apply to hr. You mean the points where she’s making fun of things and joking around as not being able to communicate? Yamada: That’s what I meant. Oguro: It certainly feels like she’s keeping others at a distance. Like when everyone shouts “Kita High, Fight!” “Yeah!” she’s the only person who doesn’t participate. Ishihara: Yes, she surprisingly keeps a distance. That’s due to complications with her family life though. Well, that’s just background information. Yamada: At first I thought she might be the kind of girl who has a broad mindset like a girl who returned from overseas and is able to see more than just two cultures. But actually, she’s the opposite: a childish-acting girl. Ishihara: This might be background information, but well, it’s written in the novel, so those who haven’t read may not know about it. I think she has a fixation about her father. Yamada: I can see that. Ishihara: I find her psychologically wanting to oppose her father is very interesting but Asuka is the stereotypical father-complex girl. Granted, saying “typical” may be an exaggeration. Asuka Tanaka is the concert band’s vice president. She’s also the leader of the bass section. Oguro: Let’s return back to the camera bokeh topic. Weren’t there a lot of cuts where you’d have like two characters conversing with one in the foreground and one in the background and you start off with the character in the foreground talking and they’re in-focus, but then you switch focus to the other character when they talk, and then switch focus again to the foreground character when they talk? I feel like there were a lot of focus swaps as the series progressed. In that example, would that type of swap be dependent on the episode director? Ishihara: Ah, that would be right. There were many times where the storyboards would have “focus swap” written on them. Oguro: You were able to show the format of how to make the imagery with the first and second episodes. Was there anything like a direction presentation manual that you created? Yamada: There wasn’t anything like a manual. Ishihara: I don’t think there’s anything special about swapping focus in a scene. Other productions do that. Oguro: But still, I think the continual swapping of focus between a foreground and background character is quite unusual. Yamada: We’ve always paid attention to the point of view of the characters. While we maintained awareness of it in the layouts and character point of view for each individual cut, I don’t think we were aware of focusing in the entire series point of view and direction. Ishihara: Also, and this is a boring topic, but recently our works have tended to increase the amount of cuts in the storyboards. There’s a lot of people in our director camp who love fixed positions, so even when there’s points with lots of characters where a pan would be nice, they’ll want to separate the cuts and maintain the fixed camera. When they don’t use a pan, that’s one cut where we could include the swapping focus between characters in the foreground and background. Oguro: When you use a swapping focus, you can fit 2 cuts in 1. Ishihara: That’s true. That’s why you have to fix the camera position when you do a cut like that. As you swap the focus between each of the two characters for people to be aware of them, you have to place them in the foreground and background. Yamada: And also it feels like you have to attach a certain meaning to that camera angle. Oguro: When those are written in the storyboards, you can check over them as director/series director, but are there points that aren’t written down by the episode director that you want to do? Yamada: But really, everyone properly writes down their plans. Ishihara: For me, when it comes times to distinguish between cuts, I may fix that by writing “insert a pan around here.” As a director, you can’t ignore the number of cuts or the ability to control the cuts. This might be said about other places too, but I question if the modern anime tempo isn’t too fast. For some reason, the number of cuts has increased to about 350 per episode. In the past, we’d cut it off at around 200 cuts. Ishihara: I still think the ratio has gone a bit too high. But if the cuts don’t accumulate, then the tempo doesn’t rise and you get a tedious episode. You’re anxious about both of those when making the storyboards. A while ago, I read a movie instruction book by a movie director and he wrote “reduce the number of cuts at any cost.” (laughs) I think you can do that and not bore your audience, but it’s not as simple as that, as you’d expect. There’s also the problem with anime where you can’t increase the number of cuts or else you run out of time. Oguro: I expected to see a full frontal attack of a performance in the final episode, but I wonder if the plan was to not run away from that from the start. Yamada: I agree. For example, episode 12 had more cuts where instruments appeared than the final episode. Oguro: Was there a period where you studied how to hold the instruments? Ishihara: Well, yes. Our company bought a euphonium and we started with “how do we hold this?” (laughs) I also bought a reference book about euphoniums. Oguro: But I’ve heard that there were a lot of members of the staff who had experience playing in concert bands. Ishihara: That’s true. Like Yamada’s older sister. Yamada: That was so cool. Ishihara: Having experienced people around saved us in situations like that. Oguro: Now that you mention it, did (Hiroyuki) Takahashi-san, the instrument animation director, have a lot of experience with instruments? Ishihara: No, to be honest, he wasn’t very familiar with instruments. If I had to say something, I’d say he’s a person whose specialty is drawing mechanical things. He’s able to imagine 3-D shapes in his head like the various revolving pipes of an instrument. For that, I think he’s a genius. He corrected many different things as an animation director. It was certainly a very painful job. Oguro: Did you use 3D CG for the instruments? Ishihara: We created rough models, but they were used as references for the layouts. Once the instrument was on the layouts, we could draw the key frames. Yamada: To add another point, Takahashi-san drew a 3-dimensional diagram of the instruments before they made the 3D models. The 3D members matched that diagram with their models. Takahashi was able to have them “use those diagrams if possible for the drawings” and he could check them. Even still, Takahashi-san had many instances where he had to insert or erase lines like for ones that were abbreviated or to supplement them at the animation director level. That was something like a code that only Takahashi-san could decipher. Yamada: Something that you couldn’t understand unless you were Takahashi-san. Ishihara: Also he attached the use of light to them as well. Shadows had to be drawn in the key frames, but sometimes you had simple replications of the 3D output. Oguro: So you hand-drew shadows and highlights on the instruments? Yamada: If they were hand-drawn, they’d definitely appear cooler. Oguro: Were there cuts made in 3D from start to end? Yamada: We used 3D for backgrounds and for the tiny people at the very back. Ishihara: It was not something we used for big objects. Fundamentally, everything was hand-drawn cels. Oguro: So were they hand-drawn because hand-drawn animation was easier to see? Ishihara: Because there would be no uncomfortable feeling viewing it. 3D animation is very slick and smooth, so if you use it in the place of drawn anime, then perhaps you attach an unnatural portion to that animation. Also, if you decide to use 3D modeling as-is, then you have the question of “how do you link it with cels?” The characters aren’t just holding something; they’re constant interacting with things, so it becomes a huge mess when you combine them. Ishihara: For me, I thought using 3D instruments would be impossible from the beginning. Yamada: I thought drawing them would be fine too. Ishihara: You’ve had a lot of experience with that in previous works too. Yamada: Haven’t I? Also, this time we had Takahashi-san revolving around the instruments, so I certainly wanted them to be drawn. Oguro: Were the reflections on the instruments themselves hand-drawn? Ishihara: The characters were projected in them, and we thought about varying the degree of light, but then wouldn’t you have difficulties seeing the characters? Oguro: There wouldn’t appear to be anything there. So you drew some vague highlights in there as well. Oguro: So, when it comes to instruments, Takahashi-san’s hands were considerably involved? Yamada: You could say he was involved in almost all of it. Ishihara: He did a lot of research on these. Our company had an eupho and trumpet, so he studied them as if his life depended on it. Yamada: He continued to draw nothing else but instruments. Oguro: Was he the one who drew the cassette tapes in K-On!? Yamada: Ah, yes he was! (laughs) Once he started drawing them, he wouldn’t stop. He was completely obsessed with them. Oguro: He’d draw cassette tape-like cassette tapes? Yamada: Right. (laughs) He loves 80s culture, so he’d get excited about episodes like that. Oguro: So if he was around, the cassette tape cut would be drawn with a lot of energy, right? Yamada: Ah, I think it’d be amazing. When I was an episode director, I had many episodes where I worked together with him as my animation director. Due to that, I’d say “well, I’m working with Takahashi-san” so I’d stuff in some cool things like cars or other mechanical things in my cuts…. Yamada: They were such amazing imagery. Yamada: Was it……. Certainly they were things he’d find enjoyable…..
Ishihara: What would he say? (laughs) He just sits at his desk without saying a single word. He’s scary; he won’t even raise his voice when he reaches the best part or something. Yamada: He’s meditating. 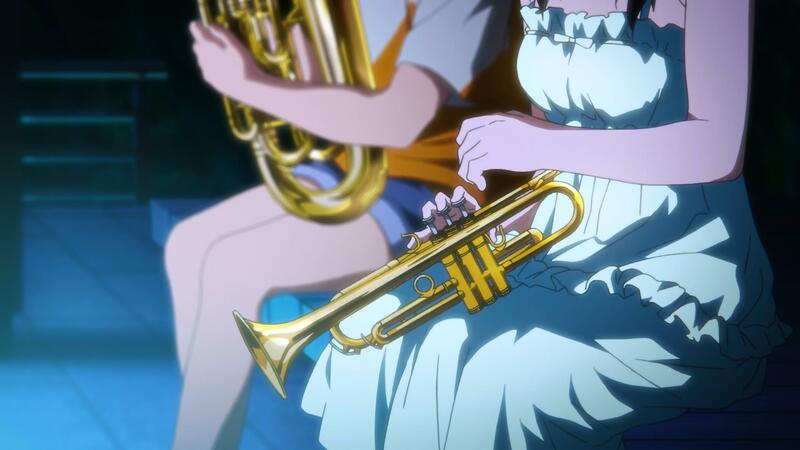 (laughs) Ah, but we did reduce the amount of scenes where instruments appeared in Euphonium as best as we could. Ishihara: Ah, that we did. We controlled that well at the scenario stage. Yamada: There were a lot of points in the scenario where we cut out instruments saying “is it alright if they’re not holding their instruments here?” before we started the storyboards. Oguro: Let’s gradually go back to the episodes; what kind of requests did you want to come out in the composition and scenario? Oguro: That’s completely different than how it looks now. Ishihara: Yes, we eventually went in a different direction. Episode 2 likely has the most of that in it since I handled that one. Weren’t there a lot of comedic scenes? Ishihara: That’s right. As we went into the latter half, it became more serious… Did I have any other requests? Also I had my usual request. I wanted things like an exciting bit as much as possible in each episode. Well, those are things that (Jukki) Hanada-san thinks about as a writer. It’s natural for him to structure everything while thinking about them. Yamada: Ah, like if Reina loses her love for Taki-sensei. Ishihara: Well, that would be a problem. At the beginning there was a plan like that. It’s a bit awful for Reina to enter high school having her hopes set on Taki-sensei, right? But I like that part of Reina, so I didn’t want it to be removed. Yamada: That’s why Hanada-san tested the timing of Reina saying love quite a lot. Ishihara: Right. We wanted to show everyone pointed towards the same goal of “we want our high school to win gold.” Including Taki-sensei. To do that, we had various tricks. Yamada: Ah, I agree. Kumiko is the engine that wouldn’t start until then. But that’s very like her. Yamada: She’s an unique protagonist. Yamada: I thought that’s why an episode 12 like that would be cathartic for her character. You see Kumiko start to add a little flavor, bit-by-bit, and then you get to see her bloom. I thought it would be great. Ishihara: We talked about that. In short, in the novel, Kumiko is this person who doesn’t get entangled in performances; instead she’s able to provide an objective view on other characters like Reina and Aoi. 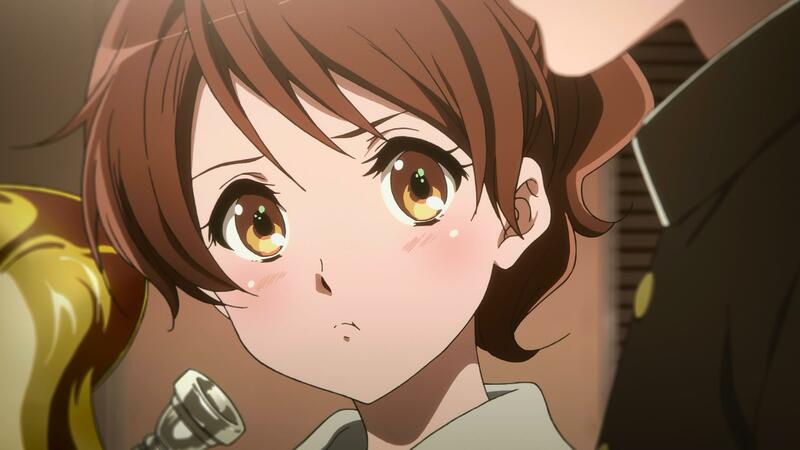 But that’s what Hanada-san worried about: he thought it’d be awful if you didn’t see Kumiko herself grow. So since it would be horrible if Kumiko herself never tasted that anguish that Reina felt at their middle school concert, it became the story you saw. Yamada: There was a point in the performance where Kumiko was absent. Ishihara: Yes, wasn’t it the scene where Taki-sensei says “Just Tanaka-san please”? That was the intention of inserting that scene. Yamada: It feels like that was necessary to do in order to make a girl who lived with the flow turn into a leading role. When I saw the storyboards for episode 12, I changed the opening part of the final episode after seeing Kumiko’s running scene. I changed it to not have the episode itself oriented towards Kumiko’s story. Originally it was supposed to detail about her, but that was without her experiences in episode 12…. Ishihara: What was she like at first? Yamada: Her stance was a little different; she was still the bored Kumiko we had seen. She would quickly turn off her alarm clock too. Ishihara: I see. In the first scenario, she would usually stretch out her arm to stop the alarm clock as soon as it rang. Yamada: At first it felt like “Get up already” but after I changed it, she had a firey attitude where she couldn’t rest. My explanation was that Kumiko was on a concert band high. But with that change, the final episode became suddenly easier to depict. Ishihara: That would be like episode 11’s re-audition for example? Oguro: That would be one or the performance in the final episode would be another one. Usually, you’d place the camera in the audience so the viewers would be moved by the visuals for example. Doing that, you not only show the performance, but the sequence of nervousness and excitement is completed. For that, you could say I believed in the power of expressing that feeling. Ishihara: Originally, I also had the thought of having this done with a documentary touch. If we did that for some reason, we’d cover them practicing and then immediately cut to the performances and concert. And then, this is something Yamada said, just seeing their performance would be enough to move the audience. Yamada: Right. That’s why I thought it’d be fine if the camera would point to the audience when we were cutting the storyboards for the final episode. They’d pick up on the importance of the drama these girls went through, so when the camera was dedicated to these unknown people, they’d have this “I can’t believe how good this is” feeling. Yamada: Yes. But that was really out of place; having strangers become overwhelmed felt a bit different from what we had shown up to that point. We thought they’d want to see the emotions that they had built up from their history. That would encourage them to dig into these girls. After all, that was the emotion that we felt while covering the concert band kids we did. Ishihara: That’s why we wanted to depict points like the girls waking up and getting to school early and the sending the truck to the concert hall with their instruments with a documentary touch. Oguro: And for that reason you ended with the end of the concert? Yamada: Yep, they’d want to see it. (laughs) Ending as the stage light comes on or as the advisor’s hand goes up would feel a bit wasteful. Ishihara: Well, I don’t dislike doing that kind of thing. Yamada: Speaking of that, concert band performances have a set time and place, so they don’t play or dance around unless it’s at a concert or such. That’s why having the tension level instantly rise while you’re watching it is immensely difficult. Oguro: It doesn’t necessarily mean they’re going to give an amazing performance. Yamada: Right, right. (laughs) That’s why trying to think what kind of response we’d get until that was broadcast would be unfathomable. Yamada: You’d insert things like “GOOOOOOOOOAL!” (laughs) Honestly, it’s a challenge to work on something where you’re quietly, quietly building up drama. You worry that the people watching would lose interest in it. Ishihara: Yep. You may have no choice but to just do it in that case. I feel like this is a work that certainly feels like a showdown with a frontal assault. If you have one, then it becomes a pain for us. (laughs) It’d be incredibly hard for the people who were drawing it. There’d be meaning in the “give it your all” that you received. Oguro: When you do something difficult, it feels like you do it thoroughly. Ishihara: Well, your customers aren’t the ones saying “It’s difficult, it’s difficult. You only do those things for those watching it. Well, it’s only difficult for those working on it. (laughs) But you give it your all drawing instruments until it isn’t fun anymore. Drawing those instruments has to feel important. Yamada: That’s right. That too is one of our essences. Oguro: You say that, but this is an enjoyable work that expresses a lot of things throughout the series. Like the expression of water or the cloudy day in episode 7 for example. Ishihara: Our staff enjoys working on those parts. Probably everyone thinks that way, but from a drawing point, those portions can be unpleasant. Yamada: What can I say about the cloudy sky in episode 7? I really love how the rainy season doesn’t feel that heavy, the white sky is bright, and you feel the ultraviolet rays from the sun in the rain. If you don’t show it as gray, then it’d be expressed as white. Oguro: Also the control of light and shadow throughout the series is impressive. The scenes with Kumiko and Reina in particular are finished extremely beautifully. Yamada: Like in episode 11? Oguro: That’s one and in episodes 5 and 8. Ishihara: The coming home scene in episode 5, huh? Where the car’s light shine after Reina combs her hair back? That part was directed by the episode director. Episode 11’s was separated at the storyboard level to an extent though. However, I think it might be possible to overdo light and shadow as a director. Yamada: When you use that, you should be a little embarrassed or have a little bit of hesitation. But if you decide to use it, make sure you decide to use it well. Ishihara: Certainly use it differently than in “The Last Supper” by Da Vinci like having the betrayer, Judas, a bit covered in darkness. Yamada: Ah, I see. Older religious paintings were painted with points like that like symbols and various meanings in the colors. Directors also have to take into consideration what many others like similar to that. Ishihara: It’s probably more spontaneous. Oguro: From our point of view, that kind of technical portion is this work’s fundamental tone, but that doesn’t have to be the case right? Oguro: So the imagery direction was straightforward? Yamada: Yes. It was important for us to “depict living things as living” in order to be “adolescent.” If you do that, you don’t have to worry about unnatural things like light and shadow direction not appearing unnatural. Oguro: But that doesn’t mean it’s a thoroughly real work. 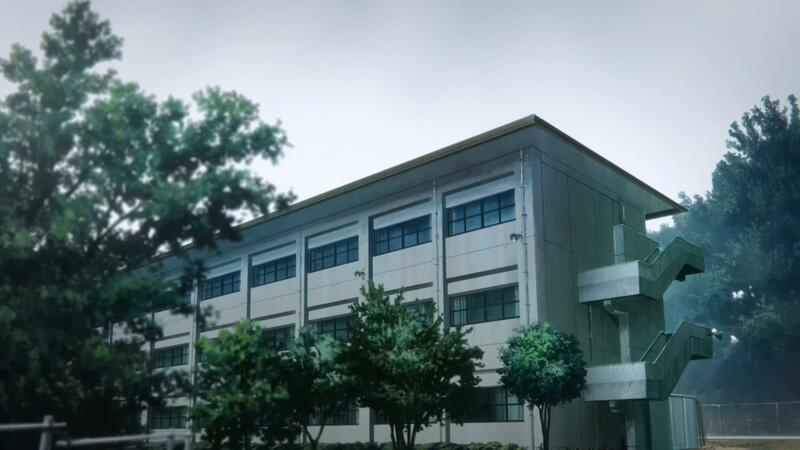 It’s natural to have typical direction and framing that you use in anime works. Ishihara: That’s right. We put in a lot of effort to make it appear real, but we also used anime devices and schemes like usual. Yamada: The most important part was the presence or reality of this show. If it feels real, we could thoroughly depict adolescence. We were aware of things like how long the girls were holding their breath in the screen or how the viewer would concentrate on the girls. If that made them feel like the girls really existed, then that makes me happy. This entry was posted in Hibike Euphonium, Kyoto Animation, Translations and tagged director, ishihara, naoko, series director, sound! euphonium, tatsuya, yamada. Bookmark the permalink. Thank you for translating these once again (my copy will only arrive in the middle of Feb, because of another release date I’m waiting on, so it was nice to be able to know what to expect when it does arrive)! Oh, Yamada…I’m not sure they have did! I am also a little curious as to what you think about it yourself? Personally, I think I’ve known enough Japanese/Asian high schools girls and women (and read enough about the problems that some people have with how America defines ‘romantic’) that I believe I understand what Yamada is saying, but I was wondering what your take on it was, if you don’t mind sharing it. There’s some full-page image collections near the first part of the interview. I had to insert my own images this time around as only the Asuka one (which I chose to use a different one anyways) was inserted. This was a lot of text back-to-back. You’ll enjoy seeing it in person. I’m not aware of the other female staff members being questioned about any yuri situation. I know Ishihara put in the Nibutani/Deko content in the second season of Chuunibyou as it was something the fans liked in the first season, but I don’t know if he’d consider that “yuri” instead of a more “Tom and Jerry” situation (opposing rivals that actually like one another). Yamada’s really the one that most people point to with yuri-esque situations (K-On!, Tamako, Euphonium), so it felt appropriate here. I’m pretty sure Yamada would not have predicted that response to Kumiko/Reina, but it’s a fair adaptation of what the novel had. Even the mangaka said “I thought it was yuri” when he first read it. It’s just what Takeda wrote. My own opinion is like this: I’ve not lived in that type of situation nor would I ever have that opportunity, being a Caucasian male who has lived in the US my entire life, so I can’t give an all-encompasing response of “it’s definitely yuri” or “it’s definitely not.” Yamada is only 31 while Ishihara and Oguro are much older and from a different time (plus they’re men). I definitely see how Yamada would feel that way as there’s a lot of close skinship in the young Japanese girl culture today. Do I see it as possible signs of something more? Absolutely. I honestly thought that, if Takeda were to go in the romantic route, the Kumiko/Reina pairing made much more narrative sense than a Kumiko/Shuichi pairing. It’s a cute pairing and one that would benefit both parties. That’s my perspective from reading the novels and what I saw from them and the anime adaptation. I try not to let any of this somewhat-bias show in my translations as people would say “he’s biased, therefore you can’t trust his interpretation” (despite Yamada refuting what I think). To me, the story is not about romance; it’s about this concert band coming together and performing to their best in order to get to Nationals. Along the way, we (through Kumiko’s POV) get to meet some characters who have some aspect to solve throughout playing together. For Reina, it was growing and being able to show her abilities were worthwhile enough to play the solo. For our next arc, it’s something different. For the final arc, it’s more about two characters everyone’s curious about. Finally, it’s also about Kumiko going from that passive observer position into an actual protagonist with goals and desires (which was covered in the anime in episode 12). It irked me to see so much discussion/debate/bile over that one aspect that isn’t even important in the story. I’ve gotten used to it (sadly), so it doesn’t bother me like it once did. Again, these are just my own personal thoughts. They’re more reflective of the novel than of any part of the anime adaptation. Yeah – I’m definitely looking forward to exploring all the content. I have another copy of Anime Style (the SHIROBAKO one), so once I heard about this one for Eupho, I knew I wouldn’t regret ordering it. In my experience, skinship isn’t restricted to young girls, though it is certainly more common. One of the adult Japanese women I know is a very touchy-feely person. In any case, I wonder how the representation of female-female attraction and relationships has related to real Japanese experiences over the years. After all, we don’t take the BL genre (or the bara one, for that matter) and suggest that that’s an accurate representation of male-male relationships. Although Yamada insists that ‘it’s not yuri’ to her, perhaps this gap between fictional genres and real life is important. So, one thing that I’d really like to ask Yamada and co. is what they actually understand by “yuri.” I don’t really read or watch that many series that fall under this label/genre, and I’m sure there are differences between yuri series aimed at male and female consumers. Is the Eupho mangaka (Hami) a guy? I was trying to look it up, and came across an interview where he/she uses “watashi,” which doesn’t tell me much about that. My own thoughts on Reina-Kumiko is that I can believe that they are romantically/sexually interested in other people at this point (and I’d be fine with Kumiko-Shuuichi, personally). But I can also see them ending up in the specific relationship that most people would describe as ‘romantic’ (= emotional and physical intimacy). I just don’t really care whether they end up being physically intimate or not, as long as their emotional bond lasts–to me, either girl forming a so-called romantic relationship with anyone else does not entail the dissolution of their bond. So I probably come across as being biased in the other way compared to you…though I don’t see it that way. 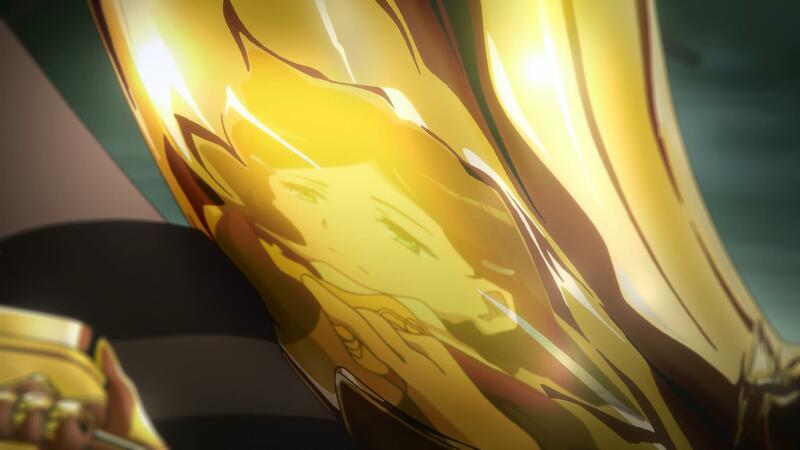 It’s complicated, and I’ve consolidated this position only after reading a fair amount of commentary by people who identify as ‘aromantic’ or ‘asexual’, but I’ve come to accept that most of the other Eupho viewers I’ve interacted with online will always see me as being biased.